In the past year (2017), I began collaborating with Slava Turyshev on the topic of the Solar Gravitational Lens, or SGL. Slava has done a tremendous amount of work on the subject already, so I feel privileged to be able to add my contribution. The concept is simple. The Sun bends rays of light. Rays passing on both sides of the Sun eventually meet. At this location, with suitable instrumentation, it is possible to form an image. And this “telescope” has astonishing powers of resolution and light amplification, which makes it possible, in principle, to use it to obtain a detailed image of a distant Earth-like planet in a faraway solar system. For starters, the focal region of the Sun begins at around 550 astronomical units (AU). One AU is the distance between the Earth and the Sun. Our most distant spacecraft to date, Voyager 1, is about 140 AU from the Sun, and it took the spacecraft forty years to get there. Nonetheless, it is possible to build a vehicle that can travel to 550 AU in 20-30 years, so the basic concept is technologically feasible. Next, the spacecraft would need to be positioned exactly on the opposite side of the Sun relative to the object being imaged. This is harder than it appears. The remote planet is not a stationary target: It is orbiting its own sun, its orbit may be perturbed by the gravity of its satellite(s) and other planets, and its sun, too, is moving across the sky. Moreover, our own Sun is not staying in place either, as it is being yanked about by the gravity of its planets, notably Jupiter. Third, the SGL suffers from spherical aberration. It does not have a focal point; rather, light is focused along a focal line. On the one hand, this is good news, because a spacecraft does not have to stop once it reaches the beginning of the focal line; it can continue receding from the Sun as it completes its imaging campaign. On the other hand, it means that any image is necessarily blurry, and requires serious post-processing, deconvolution, for it to be useful. Light in the Einstein ring comes predominantly from the region of the distant object that is exactly on the opposite side of the Sun relative to you, but there is plenty of contamination from neighboring regions as well. As you move laterally (perpendicular to the focal line), the Einstein ring changes, its light now being dominated by a different region of the distant object. So there you have it: a spacecraft can “scan” the image plane, one “pixel” at a time, while collecting light from the totality of the Einstein ring. It is easy to calculate that each square meter pixel in the image plane corresponds, approximately, to a 100 square kilometer region on the surface of the distant object being imaged. By moving around a roughly one square kilometer region in the image plane, a probe can scan the roughly 100 million square kilometer cross-section of an Earth-like exoplanet at megapixel resolution. However, we must not forget what we are looking at: a thin ring around the very bright Sun. Light from the Sun itself must be blocked out somehow if we wish to be able to measure the brightness of the ring. This can be done using a coronagraph, but in order for the coronagraph to work, we first must be able to resolve the solar disk. For this, a telescope of sufficient aperture (at least a 1-meter telescope) will be needed. In addition to spherical aberration, the SGL also suffers from astigmatism. This is due to two factors. First, the Sun is slightly oblate, as a result of its rotation. Second, the rotation itself also contributes a small general relativistic correction; this value is tiny but nonetheless, it is noticeable. It must be accounted for when the SGL’s so-called point-spread function (PSF) is calculated in three dimensions, as this will form the basis of accurate deconvolution. Next comes another factor of considerable difficulty: if we try to capture an image of a distant planet, we are not looking at a static target. 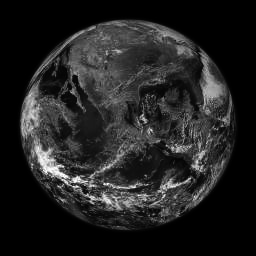 Imagine trying to image the Earth one pixel at a time, slowly (over the course of days, weeks, months, maybe even years) building a full image. Meanwhile, the Earth changes. It is illuminated from varying directions as it travels around the Sun. It may occasionally be obscured by the Moon. It rotates around its own axis. Its cloud cover changes. Even the surface changes, as vegetation comes and goes, as ice caps grow and shrink. Some of these changes (e.g., illumination, rotation) can be modeled, and that is a good thing: they can in fact help with the deconvolution process. But other changes (such as weather patterns) are more or less random, unpredictable. In some cases, it might be possible to filter out such contributions as noise, but nonetheless, what we are really trying to reconstruct is a dynamic view of the distant planet, evolving over time. Lastly, although the Einstein-ring forms around the Sun, it is still well within the solar corona. As it turns out, this is less of a problem than one might think. First, the Einstein ring is thin but bright; compared to its brightness, contribution from the solar corona can be neglected as noise. Second, the diffractive effects of the solar corona (which is really just the glowing, but otherwise transparent, upper atmosphere of the Sun) are negligible at optical frequencies. 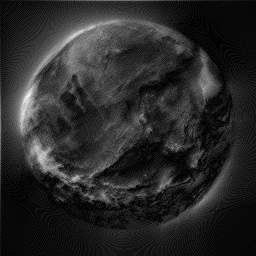 Deconvolution (data collected one pixel at a time). One possible way to overcome the technical challenges is to use not a single spacecraft but a swarm, perhaps even several swarms, working in tandem, offering redundancy and speeding up image collection. We have already written a number of papers and articles about this topic. Some of these are listed below. So far, our main focus has been a wave-theoretical treatment of the spherical Sun. Simple geometric optics will not do, despite the fact that we are talking about “rays” of light. What we need to know is how the light spreads out near the focal line, and for this, it is necessary to describe how the wavefront of a plane electromagnetic wave is distorted by the Sun. 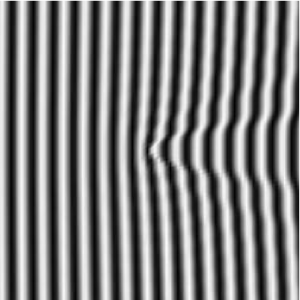 If you just look at this image for a few seconds, an ever so faint concentric pattern should become apparent. 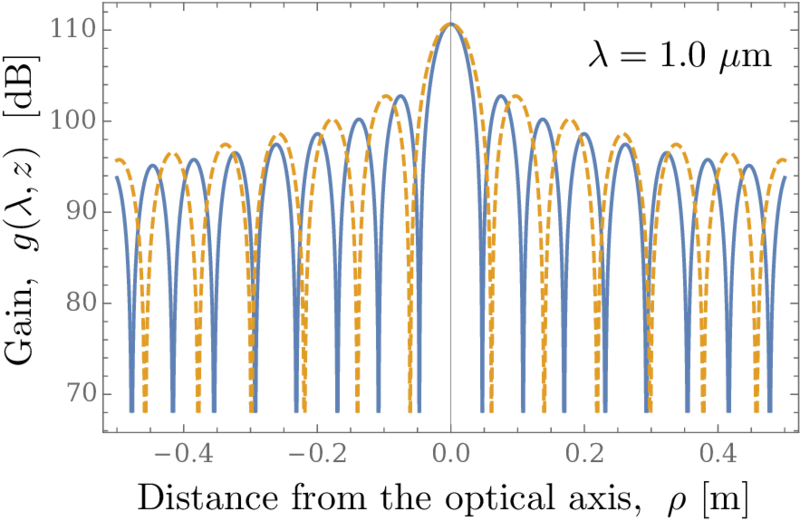 This is indeed how the waveform can be characterized: it is the combination of a deflected plane wave and a perturbed spherical wave. It is this waveform that yields the gain pattern that was shown in the preceding figure. The math becomes more complicated as we add contributions from deviations of spherical symmetry by the Sun, the solar atmosphere, and solar rotation, but the basic principles remain the same. Key to deconvolution is a theorem that reduces the task to a Fourier transform of the convolved image, to be divided by the Fourier transform of the PSF; the original image can then be obtained by performing an inverse Fourier transform.